This summer has been full, full, full. And I am feeling done, done, done. 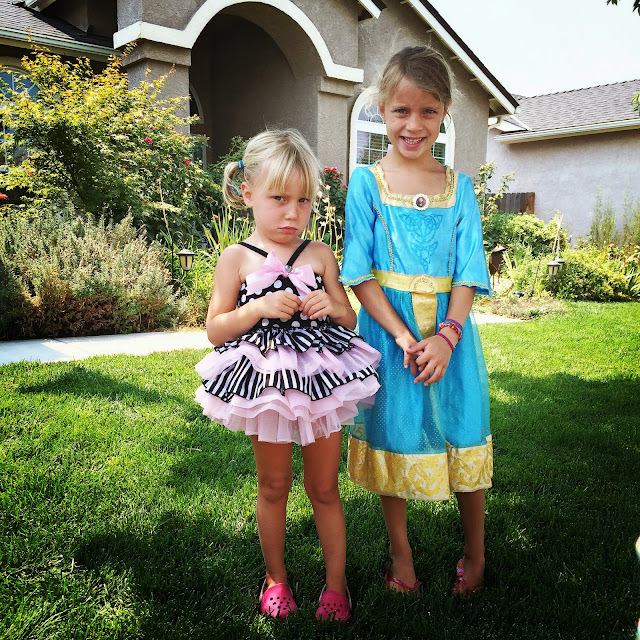 So while the summer heat is dragging on and little girls are insisting on going to the grocery store in costumes (a losing battle, so they did), I have decided to launch our school year on Monday. Curriculum has arrived, supplies have been bought and arranged and the children need less free time (read that "fight time") and more structure. Says the Momma in the house. 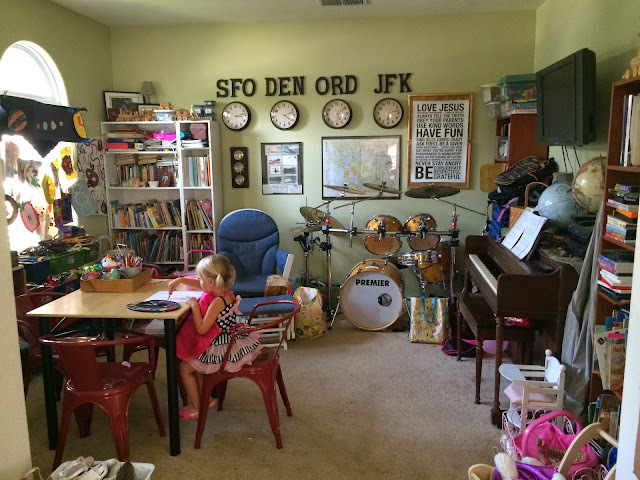 We used to have this large open space for toys, which sounds grand, but all the girls did all day was spread out their art and craft supplies all over it, mixing it in with the zoos created from blocks and rubber animals and perhaps some hotwheels cars and dolls for good measure. This then created a clean-up nightmare complete with some good 'ol mommy threats about throwing away perfectly good toys. So I put in a table and chairs. 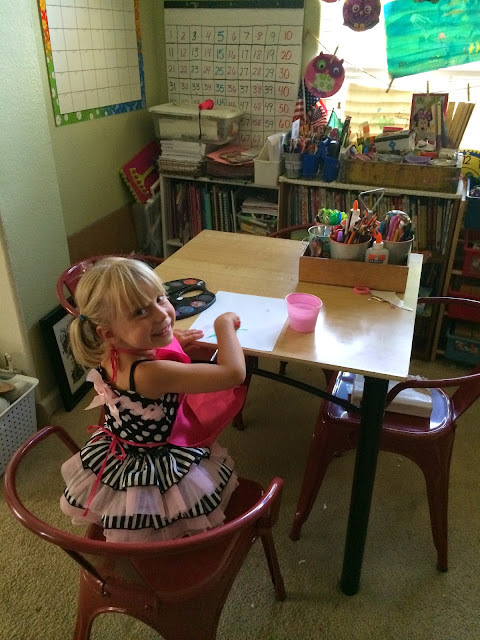 We have less floor space but a great area to do arts and crafts. It is daily used. Those red chairs were at Target for $15 each on clearance last month. Thank you, I'll take four. So this actually has done nothing to help the dumping out of everything in the room, and ergo the mommy threats, but at least it's keeping drippy glue and tape off of the floor and stabbing scissors on the table where they belong. Everything is in its place, but it's never a pristine place. This is a place for scrap paper, creative odds and ends, art projects and crafts supplies of every kind. Basically any kind of supply you can think of can be found here. The girls dig it. This is their favorite place to be most of the time. I never know what the heck half the stuff is that they have created, but I think that being imaginative and a having a place to be free to create is important to fostering their spirit. I also store all of my resource and teaching supplies in this room and a library of over 1,000 kids books which are all sorted into age/grade level. But sorting into any sort of order beyond that is impossible. Each kid knows which shelves hold books that are for them and peruse the shelves daily. That being said, this is not my school zone. I have a neatly organized (for now) place next to the kitchen table that has their school books and personal supply bins which they grab and set next to them when doing school. I have put it all together and am ready to start on Monday. Woot woot! I want to knock some days out early, because we are thinking of taking the kids to Costa Rica in the fall. They all have passports and we plan on getting several countries under their belts before they leave our roof. We hope to take them on one or two trips a year to see and experience the world. This is a huge reason we homeschool. Speaking of curriculum, everyone always asks me what we are using. It's always trial and error, but I'm excited about this year (Who am I kidding? I'm always excited about what we are doing every year). Here is a peek at my planning as I researched prices. I didn't stick with everything on this sheet, but I took a picture of my research process. Here is what my plan book page looks like for each week. I'll just write in the area of focus next to each book and then the page/lesson for the day. Hunter will be in 5th grade. Math: Saxon 5/6 I am a huge huge fan of Saxon math for 4th grade and up. Below 4th, I think it is a bit dry and easy and I've switched Ainsley out this year. Over 4th, I have never seen a curriculum that I like better for systematically and easily teaching math and reviewing and building on concepts over the course of the year. Abeka Language B: There is too much busy work so we don't do it all, but nothing is stronger for teaching grammar and writing. Nothing. Modern Curriculum Press Spelling: If you haven't checked out their phonics and spelling program, you should. I am in love. I used it when I was in elementary school and still just as strong. Easy, simple, systematic, enjoyable. Even for the upper grades. Novels for reading: Hunter reads and works through several novels throughout the year. This year he will be reading the novels: Holes, The Jungle Book, Number the Stars, The Wind in the Willows, The Trumpet of the Swan, Tuck Everlasting, The Dark is Rising, and we started The Secret Garden over the summer. 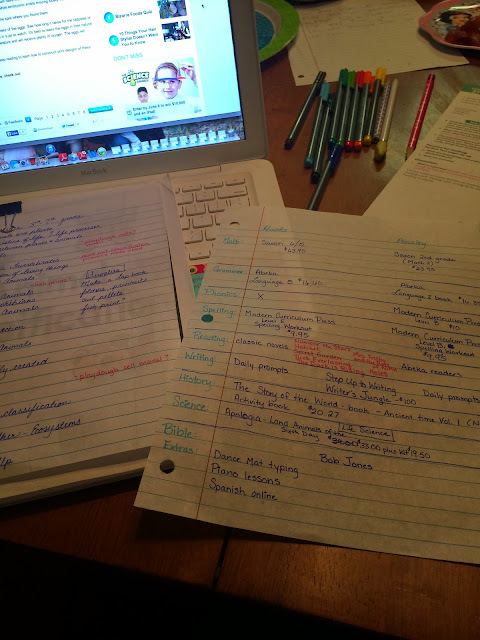 Writing: Step Up to Writing and Bravewriter's "The Writer's Jungle" are the two programs I use to teach writing for both kids. Math: I switched Ainsley to Abeka math which is stronger in the lower grades and more fun than Saxon but I really detest it in the upper elementary. By then it gets too much busy work and dry. By 4th, I switch to Saxon. Reading: Abeka 2nd grade readers. These readers are really cute and fun. Social Studies: The Story of the World, we are starting with book one which is the Ancient World. Last year we did California studies which culminated in a two week road trip around our state. This year, who knows what we will decided to do with it! Science: Apologia, Zoology. The kids are so interested and Hunter is taking life science and Ainsley a habitats class this year at our co-op so this will be a perfect compliment. Also, they have been starting to ask about creation vs. evolution so I am eager to begin some teaching on this. Bible: Bob Jones has a great Bible program which are continuing this year. They each have workbooks to go with it but we are focusing on the New Testament after focusing for two years on the Old Testament. Typing: Dance Mat Typing is an adorable free online full typing program for kids. They use it in England so we love the little English accents that the little characters use. Hunter practices for 15 minutes a day. Piano: Both Hunter and Ainsley will be taking piano lessons from a music teacher this year. 20-30 minutes a day of practice. Other: We are pretty active so PE is whatever activity we happen to be doing that day (biking, boating, skating, walking, etc.). My kids also play in community sports leagues and Hunter is in Boy Scouts. We also love to do periodic art lessons using the book "Drawing with Children" by Mona Brooks. I also took several classes on how to teach art to children and have files of lessons stored away that I drag out from time to time. Tea and poetry is just that: we have fancy tea and read poetry. We go on several field trips each year: the fair, zoo, children's plays, nature parks, museums, etc. What about Tess? 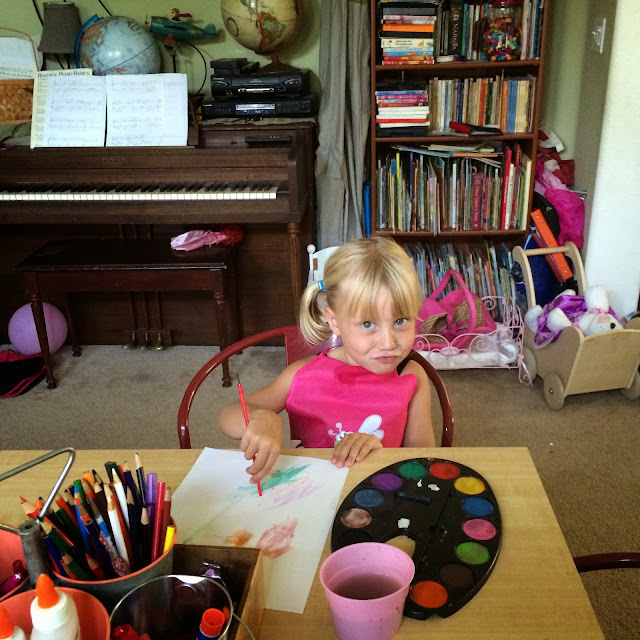 She is in pre-K and will be learning shapes, letters, numbers, patterning, colors, and pre-writing skills. I also work with her on a task or two throughout the day. 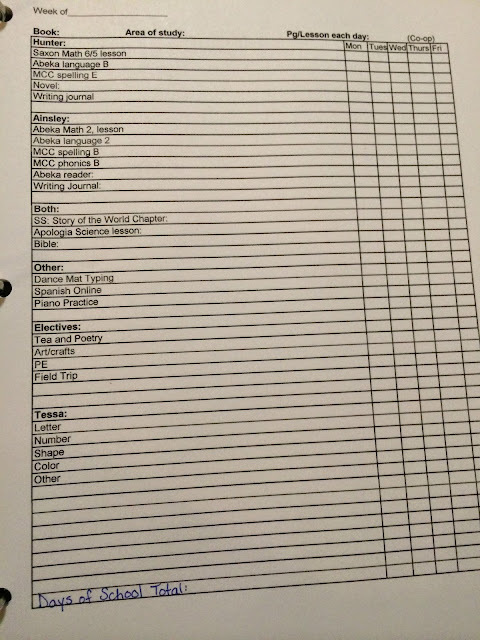 I have a fat file of activities for each letter, along with Zoo Phonics; we use manipulatives for math and counting, I buy lots of little workbooks, and we are doing "Teach a Child to Read in 100 Easy Lessons". I actually stay on one lesson though for about 3 days because it takes her that long to grasp the letter. Tessa can already blend and rhyme letters and words so she's well on her way to reading. I also use Starfall.com and Hooked on Phonics which is on my iPhone and computer. Yes, she is very capable of working both by herself so I just set her up and walk away to work with another kid. Maybe I should do a post on how I organize my day. We start our day around 9 and finish by noon or 1. Truly. We get through all of that that fast because we aren't bogged down by a classroom of kids. 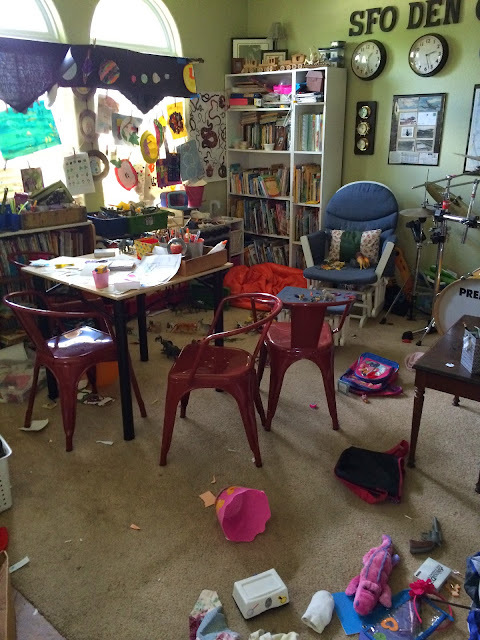 Remember that part where I mentioned the playroom was usually trashed by the end of the day? Here ya go. This is my reality. Uh huh, yep.